Greg the Poet spends his days scrubbing the deep fryer, feeding the toaster, filling boxes of nuggets and observing his contemporaries on his cigarette breaks. All the while staying cool, calm and collected except occasionally when he thinks about paying next month’s rent… One day, a manager decides on a whim to implement the new management program: a short time later, one of the crew members dies suddenly. It’s the beginning of Operation Caserio. Can a dozen self-centered, underpaid employees manage to overthrow Meecoy Carnot? 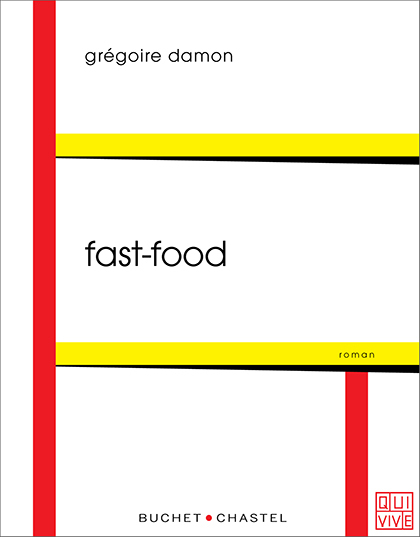 Taking a bitter-sweet approach to the world of fast food that is neither resentful nor filled with obtuse radicalism, but imbued instead with unexpected tenderness, Gregoire Damon forces us to look at the other side of the counter. The characters are endearing, and Grégoire Damon shows that he has a real knack for dialogue. With lively narration that mimics the cadence of fast-food service. A cutting but never caricatured view of the violence of new management. This clear-eyed, funny and poetical novel leaves plenty of room for feelings: friendship and maybe even love are what keeps everyone from getting ground up and spit out by the Meecoy machine.